When asked by the little voice in my head called ‘staniel’ to describe the game ‘Darkest Dungeon’ in a few short sentences without telling too much about the gameplay itself, that is the best i could come up with. However, i feel as though that a better way to describe this game is by comparing it to the beginning of a high school romance. Your eyes meet across the steam homepage, while she’s standing there in that ensamble of ‘on sale for 70% off’ and ‘very positive reviews’. She beckons you ever closer with promise of the ‘steam workshop’ and even some DLC if you’re willing to pay a shilling. Before you know it you find yourself walking her way. Sure you heard the stories about how she’s cruel and manipulative, how she always feels as though her actions are completely random and that she’ll be a darling one minute and then the next she’ll cut of your fingers for having your own choices. But you don’t care, you feel as though this chance is not worth skipping, and you go for it. You accept her request for a dance and then all of a sudden you’re hooked. After some time she seems like one of the coolest people you have ever met, but the darkness within will soon be unleashed. But that’s just putting it lightly, this game will rip your arms of, make you tap dance on hot coals mixed with razors, and even put one of those head snapping things from the movie series ‘Saw’ on you face and after all that, you still feel like you deserved it all. With the light RNG elements each time you dance your feet land on different coals or razors, or maybe even your arms don’t get all the way ripped off and are just dangling there like wet noodles. Maybe you even get a new trinket or some gems or something else useful. It doesn’t matter though, because the way that this game tortures you just makes you want to come back and do it all over again. So i guess i should get into the more ‘generic’ review/discussion stuff’. 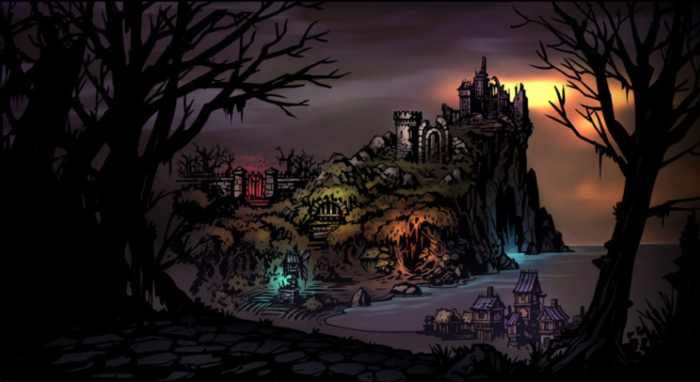 ‘Darkest Dungeon’ is a dark fantasy style roguelike RPG with heavy emphasis on the “dark” in dark fantasy. Your success in the various environments comes down to your choice of party members. from the skilled and accurate highwayman, to the bold and courageous crusader. All of the heroes to recruit to your party serve their own unique purposes and can meld together for a finely composed party (but i mean, come on quad lepper party all the way folks, and i’m only saying this because if i don’t the whole DD community will skin me alive like the heretic i am). This game is tough, stressful, and unforgiving, but i cannot put it away. The aesthetic of the lovecraftian infection on a once peaceful (if a little run down) fantasy world, spreading the sickness and in doing so bringing along ancient horrors and cultists to worship them. It’s just something that i can not unenjoy. But the piece de resistance has to be the narrator, voiced by the talented Wayne June. This performance has to be one of the best i have ever heard in video game history. Overall, this game is a blast to play and when you finally clear that level or beat that boss it’s like a shotgun shell full of dopamine straight to the eyeballs and i can’t recommend it enough. And now for a small recounting of my most crushing moment of this game. The task was simple enough, kill a madman leading a congregation of monstrosities. A crusader, a highwayman, an occultist and a plague doctor was more than enough to take down this threat, or so i foolishly thought. The twisting corridors housing the damned, my supply of torches running lower, my plague doctor reaching the brink of madness. One short rest calming the rest of my party cut short to an ambush of spid…i mean “webbers”. Through the ramblings of my medical specialist and the constant bleeding of my party members, i found this fool, this extremely large health bar possessing fool…fantastic. The battle raged on for what felt like an eternity, my plague doctor was the first to fall, the stress caused by this inflicting my occultist with madness, leading to a heart attack and soon his death. Now without any form of healing, my highwayman and crusader struggled to keep up with the flurry of attacks brought upon by this foe. The highwaymen fell to possibly the weakest strike possible by the enemy, and with that my crusader had reached the peak of his stress. His resolve tested…’hopeless’. With a final rambling, my crusader slit his own throat on his blade, resulting in a full party wipe. And the boss only had 10 health left.